Living cells are filled with RNases, but not highly destructive ones like our digestive RNase. Instead, our cellular RNases are specific and perform specialized tasks. Many of these choreograph the timely degradation of messenger RNA strands after they have finished their jobs. Other RNases play essential roles in the synthesis of more permanent forms RNA, such as transfer RNA and ribosomal RNA. Many RNA molecules are built as long precursors, which are then trimmed to the final functional length. In Escherichia coli, RNase T has the job of performing the last cut in transfer RNA production, forming the proper CCA 3' end that is used to carry amino acids. It also performs the final trimming in the 5S and 23S ribosomal RNA molecules, which have a CC sequence at their 3' ends. In other organisms, the process is not quite this simple, since some transfer RNA molecules are not synthesized with their CCA sequence built in. In those cases, other RNases clip the strand, and a dedicated enzyme (tRNA nucleotidyl transferase) builds a new CCA on the exposed end. Studies of RNase T with various substrates identified several properties that are essential for its function. First, unlike many other RNases, the enzyme can trim RNA chains very close to a double-stranded region, in fact, trimming overhanging ends all the way back to form a blunt end. 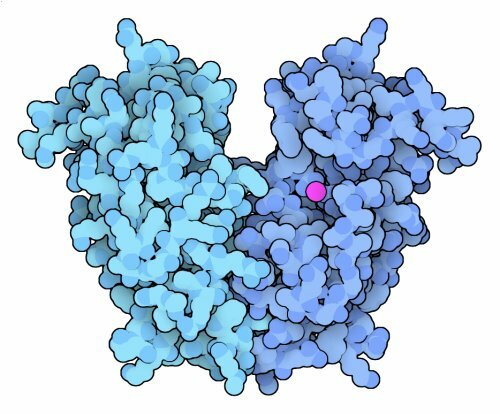 In its normal function, RNase T doesn't go this far, but it does get fairly close, leaving only a few overhanging bases. Second, RNase T does not cleave CC sequences well. This explains the specificity of ribosomal RNA processing, but still leaves a bit of mystery about how it leaves the terminal CCA sequence in transfer RNA. This may be due to the observation that the enzyme is not processive: it diffuses up to the transfer RNA, clips off one base, then diffuses away. Since aminoacyl-tRNA synthetases are so plentiful in the cell, they rapidly add an amino acid to the new CCA end, protecting it from further digestion. If RNase T does clip off the terminal A, however, it will definitely stop at the exposed CC, and the A can be added back on by tRNA nucleotidyl transferase. RNase T is a dimer, and both chains contribute amino acids to the active sites. 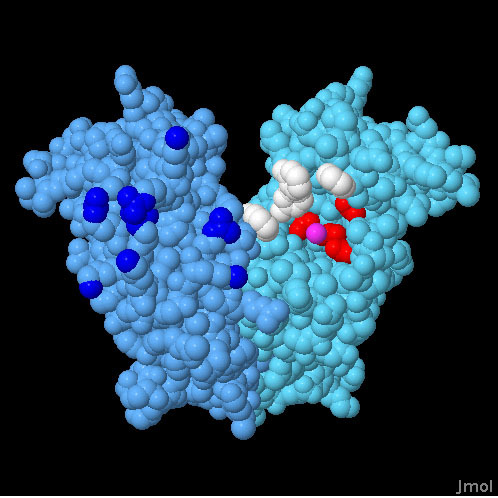 A cluster of basic amino acids, with sidechains colored blue here, are thought to bind to the tRNA backbone. Four phenylalanine sidechains, colored white, interact with bases adjacent to the cleavage site in the tRNA, providing the base specificity. Four acidic amino acids, in red here, coordinate magnesium ions (only one ion is seen in this structure, shown in magenta) that perform the cleavage reaction. Researchers at the Midwest Center for Structural Genomics have solved the structure of RNase T from two different bacteria as part of a collaborative effort with the University of Miami School of Medicine (PDB entries 2f96, shown here, and 2is3). The structure reveals the atomic basis of RNase T function. Overall, RNase T is a dimeric enzyme with two identical active sites. Each active site is composed of amino acids from both chains. A nucleotide recognition patch is donated by one chain. It is comprised of a collection of arginine and lysine amino acids (in blue in the lower image) that are expected to interact with the phosphate backbone. The other chain contains the catalytic machinery, which is comprised of a collection of conserved acidic amino acids (in red) that coordinate two magnesium ions. Four phenylalanine amino acids (in white), one from one chain and three from the other, are thought to provide the specificity that disfavors transfer RNA sequences with cytosine nucleotides. In other cases of RNA-protein interaction, phenylalanine shows weaker interaction with cytosine bases than with other bases. Y. Zuo, H. Zheng, Y. Wang, M. Chruszcz, M. Cymborowski, T. Skarina, A. Savchenko, A. Malhotra and W. Minor (2007) Crystal structure of Rnase T, and exoribonuclease involved in tRNA maturation and end turnover. Structure 15, 417-428. Y. Zuo and M. P. Deutscher (2002) The physiological role of Rnase T can be explained by its unusual substrate specificity. Journal of Biological Chemistry 277, 29654-29661.